As everyone else is, I was surprised and shocked when Skipper contacted me regarding my tank being Reef Central's - Reefkeeping Magazine's Tank of the Month. I am honored to have the opportunity to share my hobby/obsession with all of you. This hobby started for me in the late 1980's, when information was available only in 10-year-old texts and one bimonthly magazine. My first tank was a 90-gallon show tank and my main goal was to keep some soft corals and LPS alive. It proved to be a difficult task with the available 5500K metal halides and the in-tank counter current skimmers on the market at that time. Little was in print regarding calcium, alkalinity and the other trace elements we take for granted these days with the much-improved salt mixes. My attempt failed miserably after one year of fighting hair algae, diatoms and Cyanobacteria. After taking a 10-year break and finding the vast amount of new information available, both in print and online, I decided it was time to get back into the hobby. 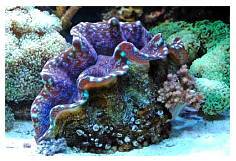 I re-started my 75-gallon Oceanic reef-ready tank in 1998 and quickly learned the necessities; that tank ran successfully for five years prior to upgrading to my current 225-gallon slice of the reef. Before getting into the practical aspects, I must thank my wife for her understanding, patience and her ability even to manage a slightly approving nod; especially when I told her I wanted to take the television out of the living room and put 250 gallons of saltwater in its place. 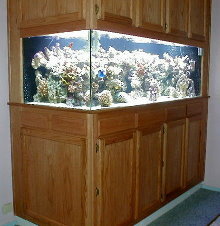 My present tank is a 225-gallon LeMar with dimensions of 72" x 30" x 24". I really like its 30" width as it allows for numerous aquascaping alternatives. 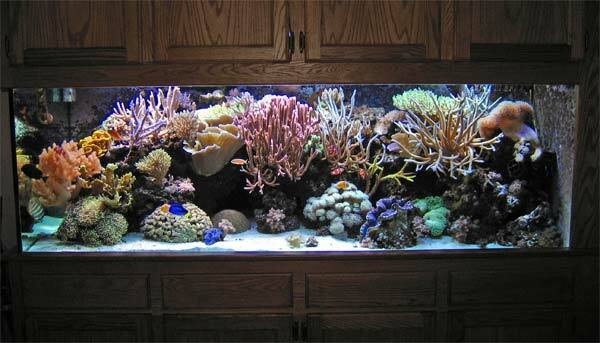 I set the tank up in January of 2004. This tank uses Eurobracing and a single corner overflow. Due to a design flaw in the tank's rear brace, I am currently waiting for a replacement tank from LeMar. The rear brace does not span the full length of the tank, so there is an unacceptable amount of deflection in the rear pane of glass. I am taking this opportunity to upgrade to Starfire glass on the viewable panes and also am including an external overflow to avoid a recurrence of the problem with the existing tank. 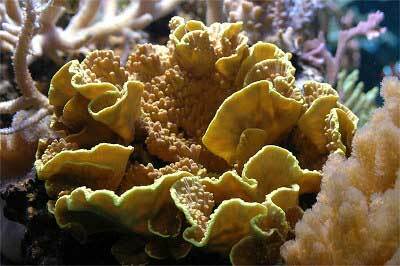 I feel it is important to be a responsible hobbyist and with the exception of one or two of my oldest SPS colonies, all of my corals have been grown from tank raised aquacultured fragments. In addition, I have provided numerous fragments to other hobbyists in my area. The overflow from the display tank is split into the refugium/propagation tank and the main sump. 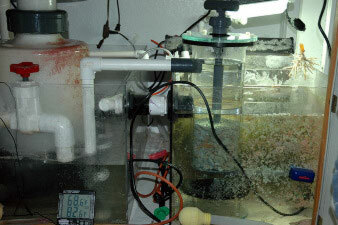 Water flows from the refugium into the main sump and is returned to the display via a Mak 4 1190 gph pump, where it is split into a 1/2" Sea Swirl and a stationary 3/4" PVC elbow. Internal tank circulation is provided by two 6100 Tunze Stream pumps on a 1094 multi-controller. Future plans include adding a separate propagation tank in the garage directly behind the tank. Most likely, 48" x 24" x 12" will be its final dimensions. 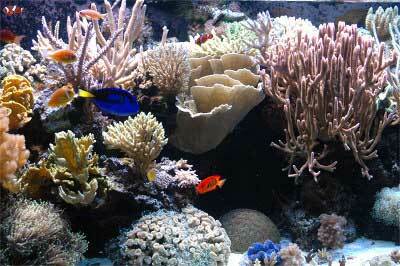 Tank lighting consists of five 250-watt metal halide lights. Three of these bulbs are double-ended BLV 10K's mounted in Reef Optix III pendants and powered by Sunlight Supply magnetic HQI ballasts. The other two are Hamilton 14K single-ended bulbs in PFO reflectors driven by the new style IceCap electronic ballasts. 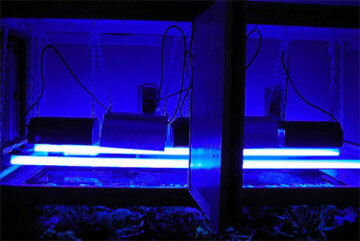 For actinic supplementation, I use two 160-watt VHO Actinic 03 bulbs driven by an IceCap 660 ballast. All lighting is controlled by Intermatic timers. The system loses approximately three gallons per day to evaporation. Top-off is achieved with a dedicated 75 gallon/day RO/DI unit housed in the garage; its level is controlled by a Kent float valve. I am currently re-thinking this setup to reduce TDS creep through the feed line. Calcium, alkalinity and magnesium levels are maintained with a MyReef Creations CR-6 dual-chamber calcium reactor filled with 18 lbs. 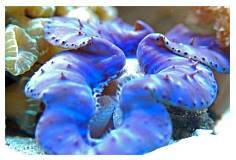 of CaribSea ARM reactor media and 4 lbs. of Korrallin Magnesium Pro granules. Nutrient reduction is accomplished with the Zeovit system. Left: MRC calcium reactor - Right: Zeovit reactor and EuroReef skimmer. 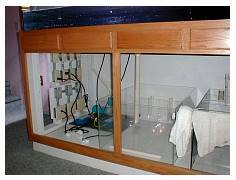 A custom-made set of acrylic tanks was constructed to my specifications. 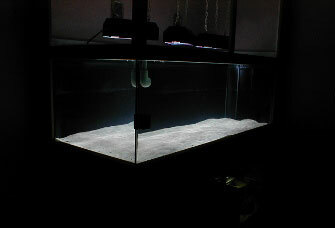 A 30" x 18" x 16" tank comprises the refugium/propagation area and is lit by a single, double-ended 250 watt Ushio 10K metal halide on an IceCap electronic ballast. The sump's dimensions are 30" x 24" x 16", and it contains the skimmer and its pumps as well as two Won titanium 350-watt heaters. My protein skimmer of choice is the EuroReef CS12-2. I have modified it by adding a third pump used only to recirculate water within the skimmer. I believe this increases the skimmer's efficiency by about 20%. Although I may be wrong about this, I believe the third pump was well worth the cost and time involved. I get approximately one gallon of dark, nasty skimmate every 48 hours from a tank I consider only moderately stocked. Minimal heating is required and is provided by two 350-watt heaters. Cooling is accomplished by two 4" dryer vents leading into the garage from the upper canopy area, and additional ventilation is provided in the cabinetry. A desktop fan blowing across the sump area keeps the tank's temperature below 82 degrees. The tank in its infancy. Water changes of 25 gallons are conducted weekly, comprising approximately 10% of the system's total water volume. 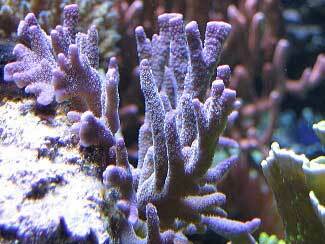 During these changes, I siphon detritus from the sump, and any nuisance algae from the display tank. I feel the frequency of water changes is beneficial more for trace element replacement than for waste removal. 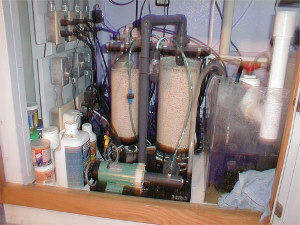 On a bi-monthly basis during water changes the protein skimmer is disassembled, completely scrubbed out and its pumps are cleaned by soaking them in a vinegar solution. 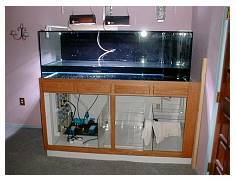 During this time, all water is removed from the sump and the bottom and sides of the tank are wiped down to remove any residual detritus. Daily feeding varies between frozen Mysis cubes, frozen Formula 1 and frozen Prime Reef as well as a mixture of Spectrum pellets, Formula 1 flakes and brine shrimp flakes. 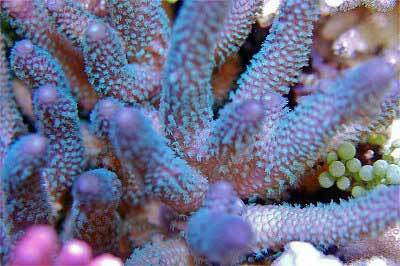 No supplemental feedings are targeted to any of the corals. My, how things have changed since I began this quest to keep a small piece of the coral reef in my home; from minimal, outdated information to the vast cyberspace of the Internet. Many thanks must go out to all who post on Reef Central and freely offer their advice and experiences to encourage the "Newbie." I truly believe that we are on the cutting edge of research and preservation of our natural resources. 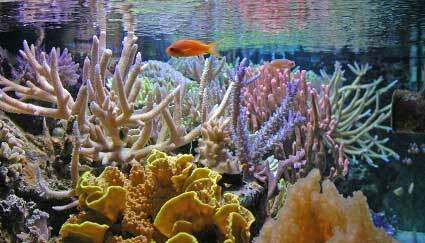 As skills grow in captive breeding of both fish and the aquaculturing of corals, demand for inhabitants from the wild reefs will diminish. 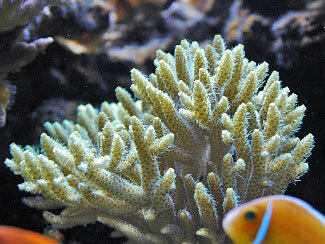 Again, I am proud to say that with the exception of two or three of my oldest corals (6+ years), all are aquacultured or have come from fellow hobbyists' tanks. Thanks again for the honor of being chosen as a Tank of the Month.